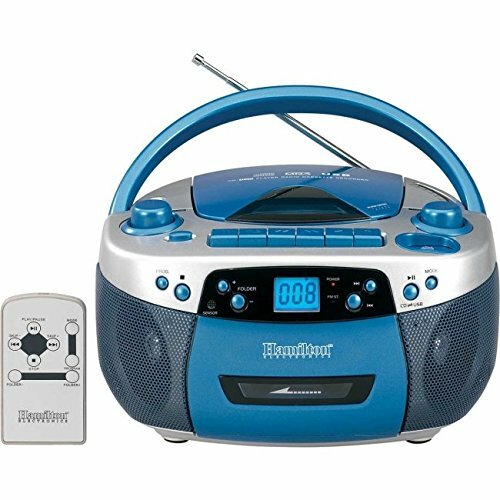 HamiltonBuhl MPC-5050PLUS USB, MP3, CD, Cassette Recorder and AM/FM Radio Boombox; Programmable CD Player w/repeat play - Plays CD Audio and MP3 files on CD; USB Port for MP3 Files on USB Memory Built-in; Cassette Player/ Recorder, records from CD or MP3; Records from CD or radio to cassette; Receives AM/FM stereo broadcasts; Dual Power: AC or 6 D size batteries; Six 1/8" headphone outputs; Stylish silver/blue housing; 4W RMS Output Power; Unit Dimensions 12 x 9 x 6 inches, 5.2 pounds; Shipping Dimensions 12 x 10 x 7 inches, 5.7 pounds; UPC 681181220618; The Hamilton MPC-5050PLUS Portable Boombox plays the media today's classrooms demand including MP3 files on CD or USB memory, Audio CDs, Cassette tapes and AM/FM Radio. An exclusive set of six 1/8" headphone jacks located on the back of the box make the MPC-5050PLUS an excellent choice for classroom listening center use; it is designed and built to withstand the rigors of classroom use while providing high quality sound. If you have any questions about this product by Hamilton Buhl, contact us by completing and submitting the form below. If you are looking for a specif part number, please include it with your message.